That’s right, wedding season is upon us. This means a new dress for every event, accessories that go with each dress, and those perfect tousled curls. Summer weddings are my favourite. No surprise there. I slightly die over all the dresses that come into season. The florals, the pastel colours, the flowy maxi dresses, all of them. But most importantly, as women, we all kind of freak out about our hair. The big question we all ask ourselves is, “salon or no salon?” I personally love getting my hair done at the salon. I mean, who doesn’t love getting a nice scalp massage? But with all the weddings in the summer/fall, the $$$ can really add up. We’re trying to cut costs here. And personally, I’d like to spend my $$$ on that fabulous dress I’ve been eyeing. So, I’ll do my hair at home. Save a couple extra bucks. You know? In fact, sometimes I prefer doing my own hair. 1. It’s quicker, and 2. If you end up at a rando salon, with stylists who don’t know what they’re doing, it ends up looking like garbage, which means you end up having to fix it yourself. So really, you just spent $75 bucks on a blowout that you could’ve done at home in the first place. Amiright?! If you have the right products and the right tools, it’s actually a lot easier to do it yourself. 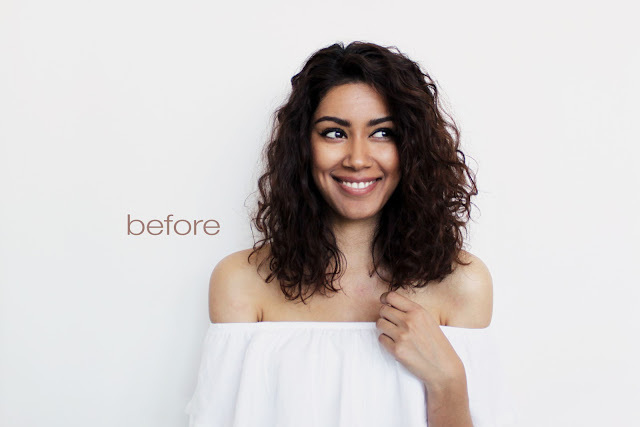 The great thing about the Unwind CurlsCalming Crème is that you can style it any way you want. So if you’re looking to do more of a wave than a curl, you just need to pull down on your curls with the crème and stretch them out this way. If you want a tighter curl, all you need to do is scrunch! I’ve been using John Frieda products for a long time now. Years actually. Think back to the high school days. My hair was BIG. The only way those curls were being tamed was with these products. Another collection I have discovered from John Frieda is called ForeverSmooth®, and I’ve been testing the waters for a couple weeks now, and I love it. This shampoo and conditioner duo is one of the best I’ve tried, actually. 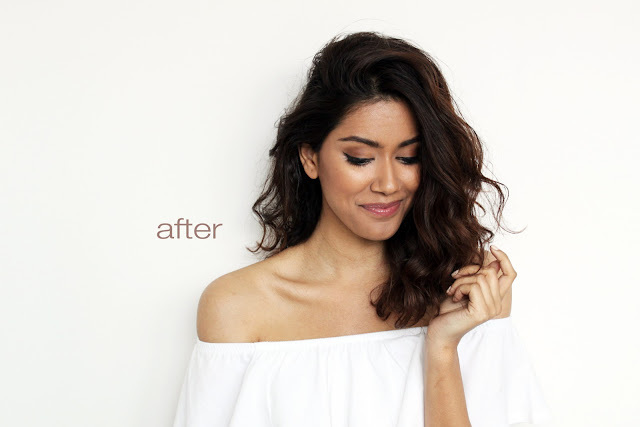 Your hair instantly, (with one wash!!) feels stronger and smoother. I can really tell when my hair feels smoother, because it doesn’t feel very smooth on the daily. With all the hot tools I use to style my hair, you can FEEL the damage in my hair. So, I love a smoothing collection! Anyways, what’s slightly psycho of me, is that I love the John Frieda line so much that I actually carry the FrizzEase Secret Weapon® Touch Up Crème in my car. Crazy? Wtv. You never know when you’re going to need a frizz touch up…you know? Just a few drops in hand, rub them together and run your fingers through your hair. This HONESTLY gets rid of my frizz. Like, there is nothing worse than curly baby hair frizz. And if this product works on my hair, it will work on yours! If you guys are looking for some new hair products, I definitely recommend trying out this line. The BEST part is that you don’t have to break the bank for this one! Most hair products are crazy expensive. I love that this line is affordable and works like a charm. Okay, who already uses this line? I’ve been obsessed with John Frieda products since the teenage years, and I’m SURE some of you have been too! Share! This post was sponsored by John Frieda Canada. As always, all opinions are my own. Previous Post 30TH BIRTHDAY REAL TALK – WHAT I’VE LEARNED. Next Post OUT WITH THE OLD, IN WITH THE NEW. DECLUTTERING YOUR LIFE AND YOUR CLOSET. This is undoubtedly the most special event venue in the city. We had 6 passed appetizers with the Liguria table which consisted of steamed veggies and fruits and breads. I didn't even care that I'd just been to another feast less than 12 hours ago. At Los Angeles wedding venues I could not stop eating. This product really works for curly hair. I just want to ask you about the product that is beneficial for treating hair loss. Nice blog. I too have fizzy curly hairs and its hard to manage them. In fact they become more fizzy and ruff nowadays.Saloon products are so expensive and i don't have time to go there. thank you for helping me!!!! Thanks for sharing post. This hair product is really useful. Your hair is nice.